This week we attended a hearing of the Senate Health, Education, Labor and Pensions (HELP) committee where there was broad bi-partisan support for giving billions more to the insurance industry to “stabilize the market.” The government already gives for-profit insurance $300 billion annually and their stock values have risen dramatically since passage of the Affordable Care Act (ACA), so the rush to give them more was disheartening. That was contrasted with a meeting with the staff of Senator Bernie Sanders about the improved Medicare for all bill he plans to introduce on September 13. Sanders, along with other Senators, is seriously trying to figure out how to transform health care from being a profit center for big business to being a public good that serves the people. That means doing away with the health insurance industry, not giving them billions of public dollars. The contrast reinforced the need to advocate for improved Medicare for all and push for the best healthcare system we can create. Healthcare a Commodity or a Human Right? Senators are back from their long summer recess, and they started off with health care back at the top of the agenda. The Senate HELP committee held its first of four hearings on September 6, and Senator Bernie Sanders is preparing to introduce a Medicare for All bill on September 13. The two efforts are a clear example of the underlying dilemma that we have faced in the United States for the past 100 years: Is health care a commodity or a public good? It can’t be both. The failed efforts to repeal and replace the ACA took up a lot of time and energy this year and left the country in no better position to deal with the ongoing healthcare crisis. Now, time is really short because private health insurers are announcing their rates for 2018, and they are, not surprisingly, screaming for more money because they have to (*gasp*) pay for health care. Instead, the entire hearing focused on “stabilizing the insurance market,” even though their stock values have quadrupled since 2010. Five health insurance commissioners from different states testified before the senators and answered questions. It appeared that all had been well-prepped by the health insurance industry. The committee members patted each other on the back for being bi-partisan, unfortunately they were working together for the insurance industry, not for the people. The bi-partisan hearing discussed three main points: making sure that public dollars were available to subsidize insurance costs, reinsuring private health insurers so they would be protected if they had to spend ‘too much’ money on health care and incentives to entice private insurers back into areas that are not profitable. Coincidentally, these were the same points raised in the bi-partisan proposal published this year by the Center for American Progress, a Democratic Party think tank financed in part by health insurance lobbyists. Both parties are clearly on the side of health care as a commodity. Not one person participating in the hearing questioned whether health care belonged in the market. At least one Senator, Rand Paul, complained about Big Insurance coming to Washington with their hands out and said he would rather pay directly for health care than give the money to Big Insurance. His ideology is far from supporting Improved Medicare for All, but he did call out the corruption. Perhaps the most disappointing of the day was Senator Al Franken, who has completely bought into the ‘health care is a commodity’ camp. Not only did he advocate for subsidizing and reinsuring private insurers, but he called for a federal reinsurance program to cover the costs of people who need health care, at least after Big Insurance takes their cut. And Franken, who tried to make jokes about the hearing, called for more money to advertise and lure youth into the insurance market, which is about as unethical as pushing cigarettes or candy, and wants heavier enforcement of mandates to purchase health insurance. Franken touted a ‘virtuous cycle’ of giving more money to health insurers so that they lower premiums and more people buy insurance. The problem is that there is nothing very virtuous about spending billions to subsidize an industry that has a greater responsibility to pay its Wall Street investors than to pay for necessary health care. The insurance industry has shown itself to be insatiable, and ready to use their power to extort Congress because they hold people’s lives in their hands. It was a difficult hearing to attend. The whole time we wanted to stand up and ask whether they could possibly see how ridiculous this all appeared and whether they thought private health insurers added any benefit. But, the Capitol Police made it clear from the start that they would arrest anyone who disrupted without warning, and we had a meeting scheduled with Senator Sanders’ staff after the hearing. 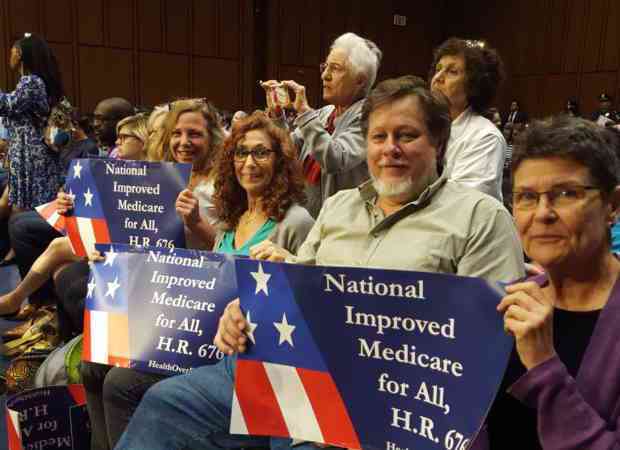 We did manage to squeeze out a few “Medicare for All’s” during the hearing. The meeting with Senator Sanders’ staff was like night and day. We began from the premise that health care is a human right and had a frank discussion of how that could be achieved. The text of his upcoming bill was not available, but for 90 minutes we discussed many of the details of the bill. This meeting was scheduled because of a letter that the Health Over Profit for Everyone steering committee sent to the Senator’s health staffers raising concerns about what was reported to be in the bill. An initial response was lacking, but once the letter was widely circulated in progressive blogs, the staff were ready to meet. There has been a movement for National Improved Medicare for All in the United States for a long time. People in the movement have debated and reached consensus about how an improved Medicare for all system ought to be structured. Much of that is embodied in John Conyers’ legislation, HR 676: The Expanded and Improved Medicare for All Act, which has 118 co-sponsors. Senator Sanders and his group, Our Revolution, are raising funds and working to build more support for Improved Medicare for All, but they still need to cooperate with those who have been advocating for this if they want full support. Fortunately, Senator Sanders has demonstrated that he is responsive to public pressure. He started the year off not intending to introduce Medicare for all legislation, but he received push back and changed his mind. Then he started talking about fixing the ACA and introducing a public option, and there was pushback against that. There has also been pressure about the contents of the bill. When it was learned that there would be co-pays, many organizations, including Physicians for a National Health Program, contacted his office to say that co-pays add more complexity to the system and cause people to delay or avoid necessary health care. His staff reported that co-pays have been removed in the bill except for purchasing drugs, in order to encourage the use of generic drugs. In the process of winning a single payer healthcare system, the movement for National Improved Medicare for All has the role of being the watchdog to make sure that we create the best system we can. We want this system to work for everyone and to be a system that improves health, a system that the United States can be proud of. This is a role that will be ongoing even after we win because we will have to improve the system and constantly guard against those who would try to privatize it so they can profit. After meeting with Senator Sanders’ staff, we felt more reassured that his intention is to ultimately create a strong National Improved Medicare for All system. There are many provisions in the bill that are to be applauded – providing care to every person in the United States and offering fairly comprehensive coverage – and a few that we will have to work on – such as including long term care, abolishing investor-owned health facilities and a more rapid transition period. On September 13, if all goes well, the text of the bill will be released and we will assess it. All in all, we are in a strong position. The Senate HELP committee hearing showed how out of touch many of our legislators are with the people, who favor Improved Medicare for All or are just yearning for affordable health care no matter what form that takes. And, we know members of Congress can be moved, some more easily than others. This week the architect of the ACA in Congress, former Senator Max Baucus, who had us arrested with six others in 2009 when we stood up and called for single payer to be included in the debate, joined the choir. Baucus said single payer is the answer, commenting “we’re getting there, it’s going to happen.” We were arrested demanding that he put single payer on the table and he refused, calling for more police instead. Now, more than 100,000 preventable deaths later, he supports it. The ACA was born out of the corruption by healthcare profiteers and everyone involved from Obama to Baucus knew it, and everyone from Alexander to Franken knows that remains true today. The tide is shifting in the United States. After a century of what Professor David Barton Smith, a health historian calls, “more palatable approaches” that have each “self-destructed,” we are clear that health care is a public service, not a financial profit center. We are ready to do the work to make what was once considered impossible, National Improved Medicare for All, become inevitable. Each week, new support for single payer arises. The other surprise this week was the support of centrist Democrat, Senator Jon Tester of Montana, who explained that his farmer parents never had insurance until they were old enough for Medicare. The practical mechanics of how to make such a universal health insurance system work are a lot easier than patching together the existing hopelessly fragmented private-public health insurance system. The Medicare program actually does this quite well and the cry of Medicare for all has never been silenced. Indeed, no one has ever objected to their ‘mandated’ coverage under Medicare. The people have the power to finally make the government do the right thing. No more compromises. No more false solutions. Onward to National Improved Medicare for All. This article was posted on Saturday, September 9th, 2017 at 5:55am and is filed under Activism, Health/Medical, Insurance, United States.